Build a Well-Structured All Purpose Storage Barn. If you need any kind of storage, be it large or small, basic or detailed, here at D Cross Barn Co. we have you covered. You might be looking for a storage barn for a variety of reasons and our own storage sheds are built by professionals who have more than 30 years of experience. 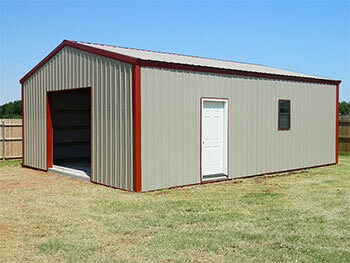 Our custom storage barns are built to last so whatever the reason you need one we hope you will consider us. What makes us a great choice? First of all we can take your specific design, or create one for you, that is built to your preferred specifications. Secondly, our materials are only the best in the industry so your post frame building will be sturdy, constructed professionally and best of all, be one-of-a-kind. Thirdly, we know barns! We have over 30 years experience building barns and post frame buildings. We hope that you will call D Cross Barn Co. for all of your Oklahoma barn construction needs. Maybe you prefer a steel frame building; our professionals can construct the building with the leading industry materials. What are the advantages of a steel frame building? They are eco-friendly and weather resistant which are two important factors to many shed owners today. Let one of our qualified D Cross Barn Co. construction experts provide a quote for you today if you’re ready to start construction on your Oklahoma steel frame building. If you have an idea of what you want, but aren’t exactly sure where to start, not to worry. This happens in a lot of cases but our Oklahoma team of professionals at D Cross Barn Co. can provide an array of options to help you. How does this work? We listen to your wants and needs for the barn you want to build and then we create a plan for your building so that you can visualize just how it will look and customize it as needed. Your dream will soon be a reality when you work with us because we use only the highest quality materials, tools and experts. Contact D Cross Barn Co. today if you’re ready to begin creating the storage building you’ve been wanting for awhile now. Our experts can provide a quote for constructing your custom building. If you enjoy savings then you’ll be happy to learn that we also provide contractor material packages. The savings we get are passed on to you. Whatever materials you might need or services you require D Cross Barn Co. is here to help you make it happen.